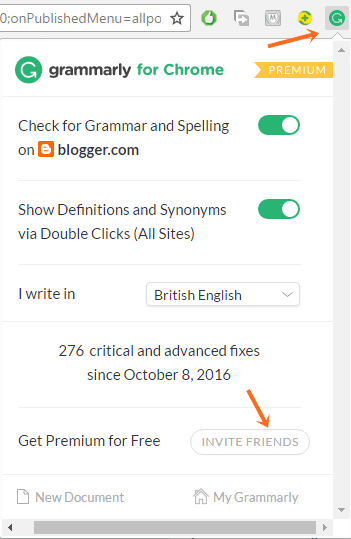 How to Get Grammarly Premium For Free! Get 1 week of Grammarly Premium for free. When you invite your friends, and they sign up and install Grammarly extension, you'll get 1week of premium Grammarly. And gift them 1 week of premium Grammarly. Sign up with this link and install the browser extension to get Grammarly Premium For 1 week For Free! You can find your Grammarly Referral link by clicking on the Grammarly icon in the extension bar.